Almada is just across the Tagus River from Lisbon. It’s accessible by ferry, bus, train, and car, the last three quite simple by crossing the Ponte 25 de Abril, also known as Lisbon’s Golden Gate Bridge. It’s a large suburban area with several urban and village centers, beaches, and a fishing area. Taking the ferry from Lisbon’s Cais de Sodré to Cacilhas lands visitors at a seaside area that has some restaurants and a dockside area with people fishing. 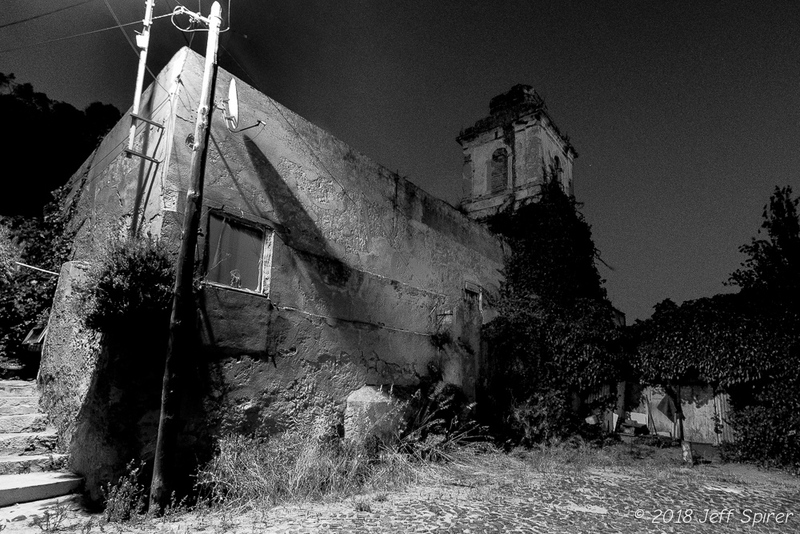 It also has a beautifully run-down set of buildings along the water. They’re all falling down and going inside would require a hard hat as they seem to decay regularly. There are two directions to go form the Cacilhas ferry terminal. 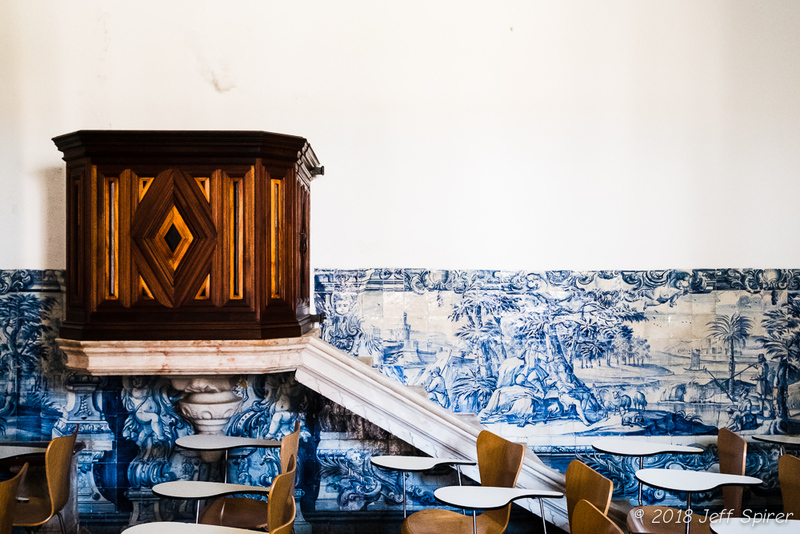 One is towards the bridge and offers a terrific view of Lisbon from a glass elevator that goes up the rock face. The other direction is into the city of Almada. 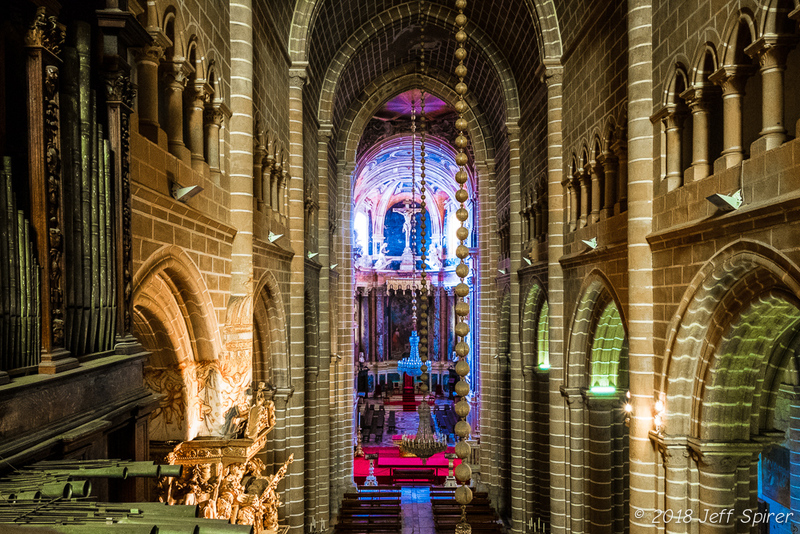 Almada isn’t known for historical landmarks in general, but does have some excellent restaurants, a nice church (what city or village in Portugal doesn’t have a church? ), and a relaxed feeling. Not that far from the center of town is an area known as Romeira. 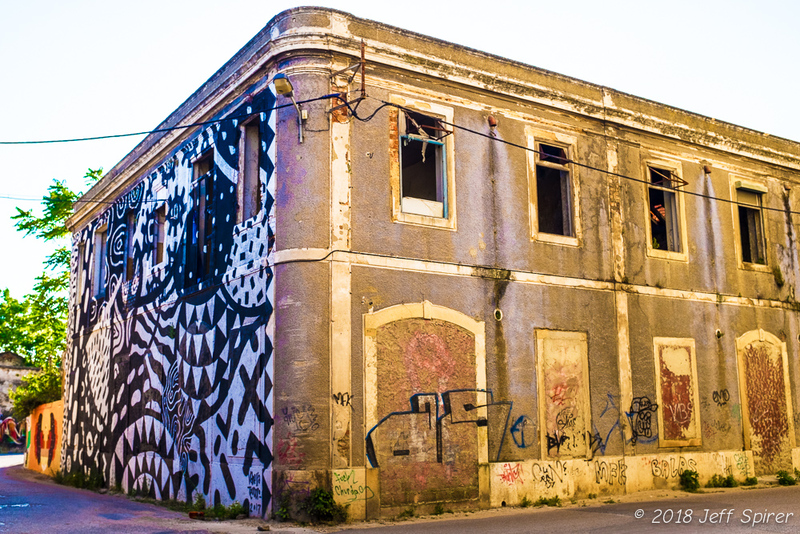 Romeira features decaying industrial buildings, including some spectacular towers that once held flour, some of the best street art in Lisbon, and a small number of people living in makeshift homes. There’s traffic through it but not many people walking, giving it a somewhat edgy feel. It’s a photographer’s paradise. 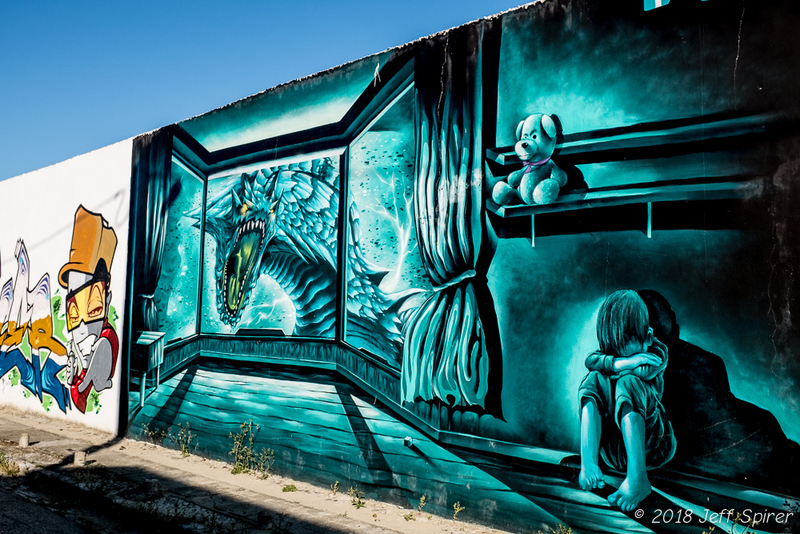 Some of the best street art here is by well-known artist Styler. Another ferry goes from the Belém district of Lisbon to Trafaria, a bit west of Cacilhas. Trafaria greets visitors with a small beach with boats haphazardly strewn across the beach and moored in the water. Looming over the beach is more industry, dominating much of the landscape. The village by the water is typical of Portugal, with narrow streets and alleys lined with small houses, and restaurants that grill sardines outside. 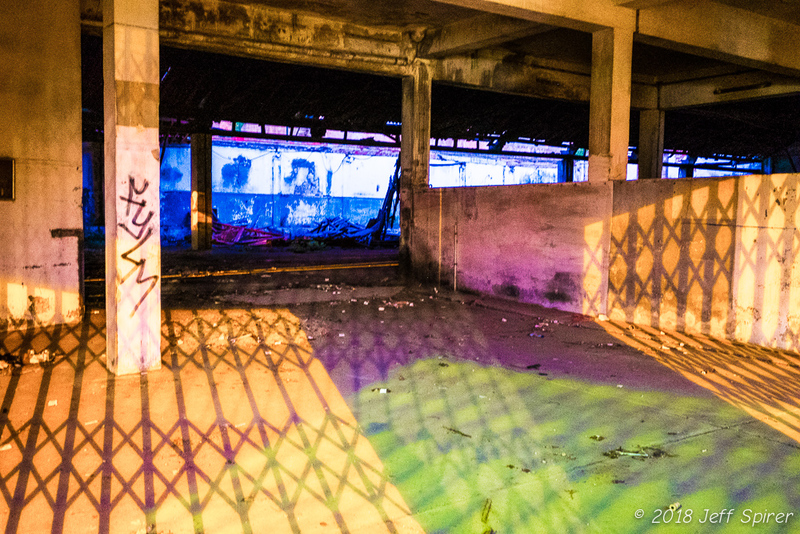 Some structures, especially the industrial ones, are decaying, like in so many other places with dead industries. 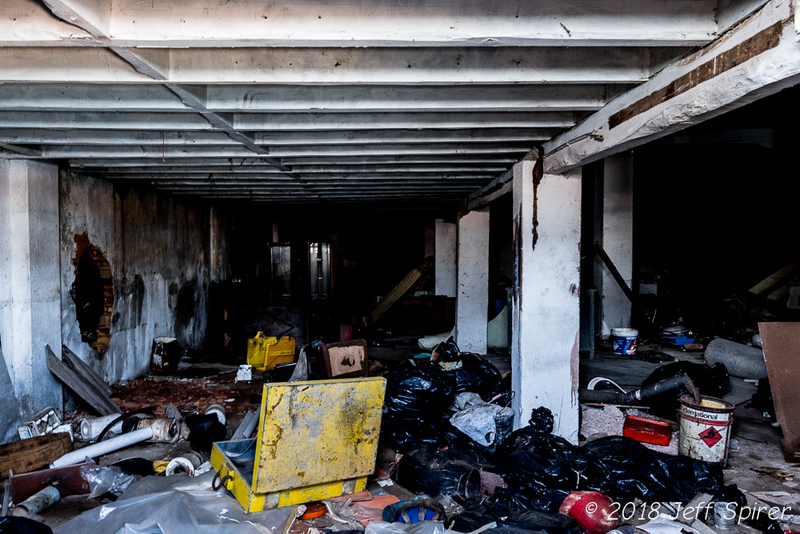 The only signs of life in these buildings are feral cats and kittens. Old buildings including forts can be found around Trafalgar. The structures closest to the water are fenced off and the ones inland are difficult to access. Those are being saved for a return trip, along with a visit to a long-closed water park, once local assistance is enlisted. 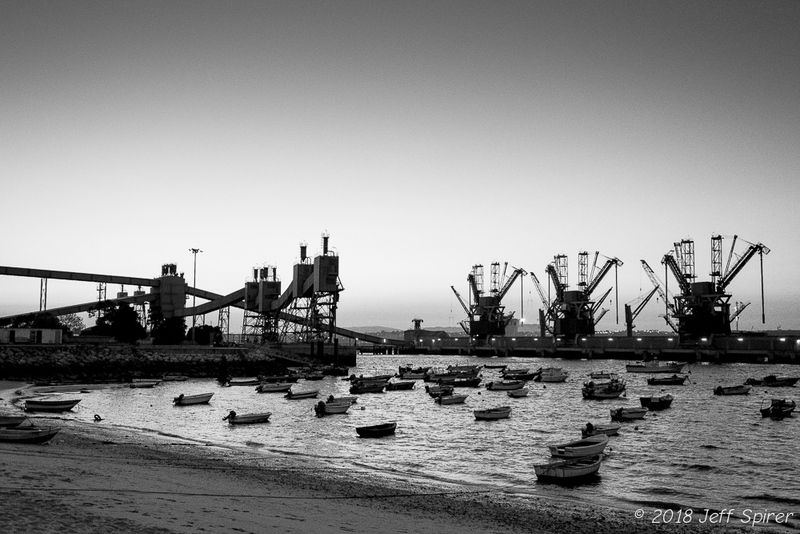 Thanks to Anabela Melo de Carvalho for information about Almada. Construction of a walled village began in the eighth century on a hill about 80 kilometers to the north of Lisbon. 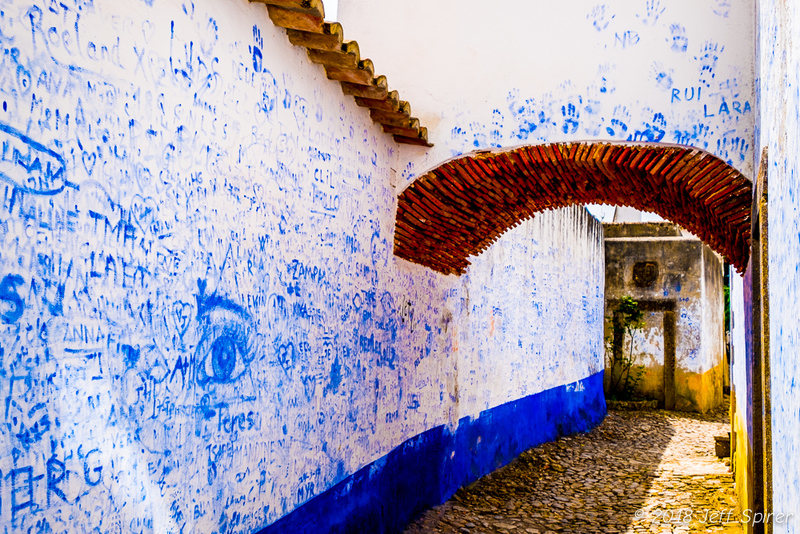 Originally a Moorish town, it was captured by the Portuguese and its wall and castle underwent significant renovation. 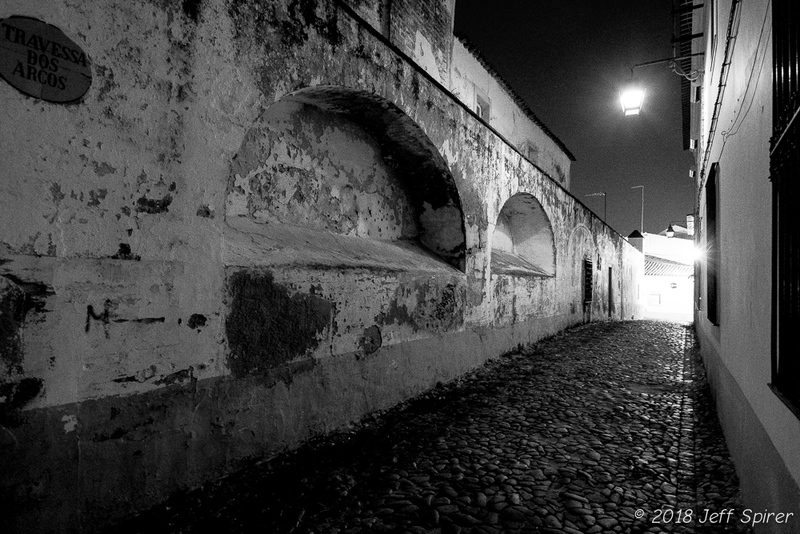 Although the 1755 earthquake caused significant damage, the wall, castle and medieval streets still exist. 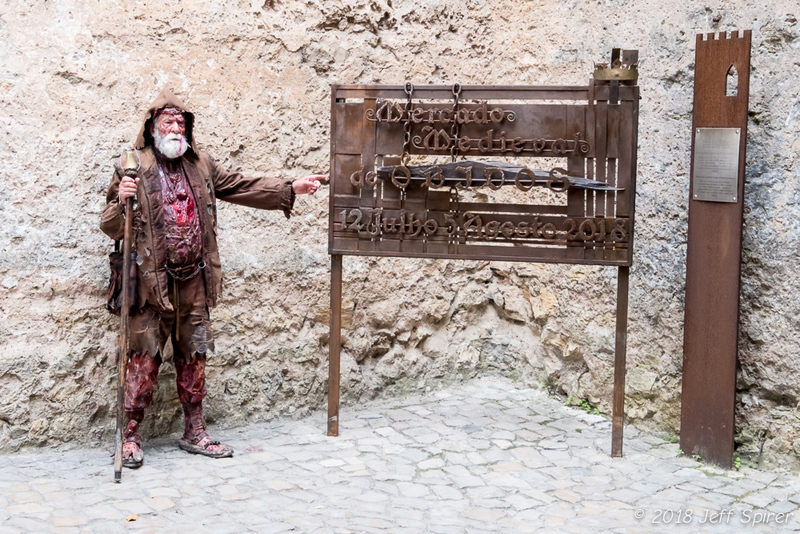 Unfortunately, our visit coincided with the annual Medieval Market, two weeks in which the town transforms into a festival with medieval costumes and customs everywhere. While that sounds like fun, and to some extent it is, it also makes the town feel a bit like a Disneyland attraction, teeming with tourists (both Portuguese and foreign) crowding almost everything. It’s a good thing for the town, bringing money into an area that doesn’t have much beyond agriculture and tourism. 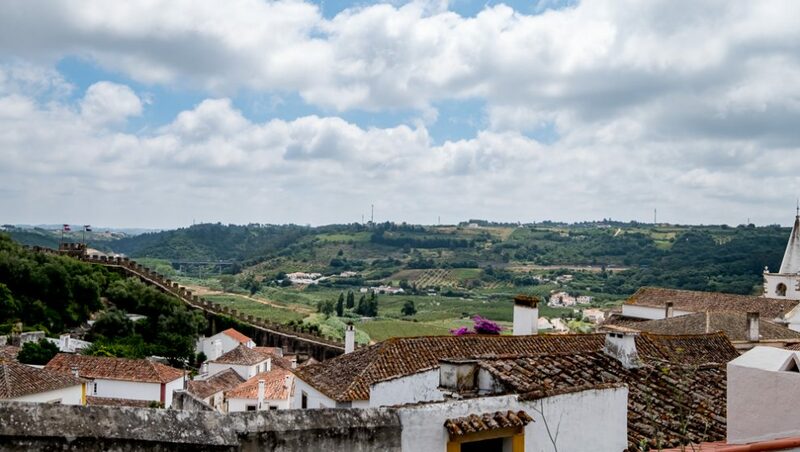 The hilltop location means terrific views of the pastoral valleys that surround Óbidos, with farms popping up beyond the rooftops. There’s vineyards and undoubtably olive trees. The castle is impressive, with towers and a walkway across the top that is populated with visitors. Although well-preserved, there are places, especially the steps up and down, that feel less than secure. 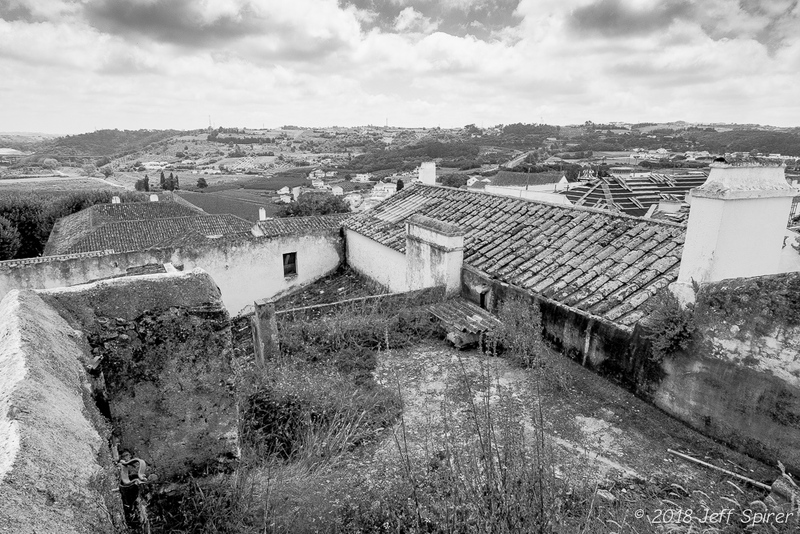 What does keep Óbidos from going full-on DIsneyland are the occasional views of the castle intermingling with the lives of the residents. As with everywhere in Portugal, including the heart of the cities, laundry is hung outside as dryers are rare. 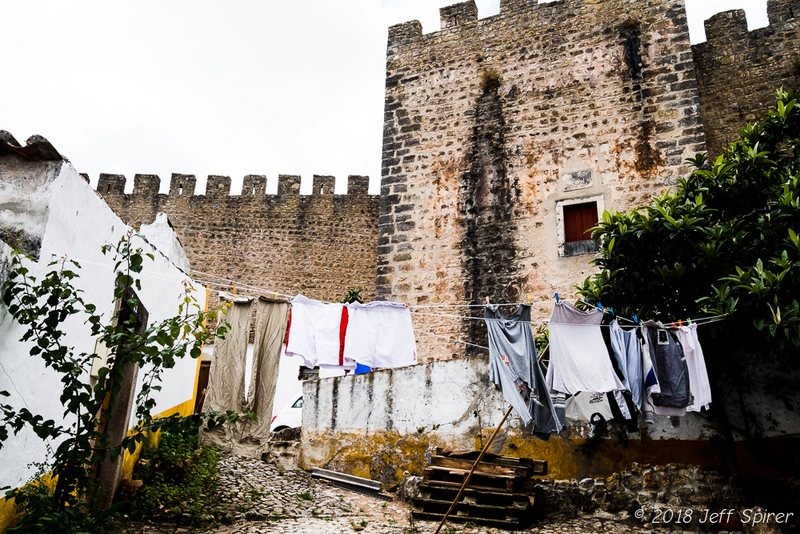 What an amazing experience to go outside to hang up the laundry in front of a castle dating back 1000 years! Another intersection of the current and the past shows up in the graffiti. 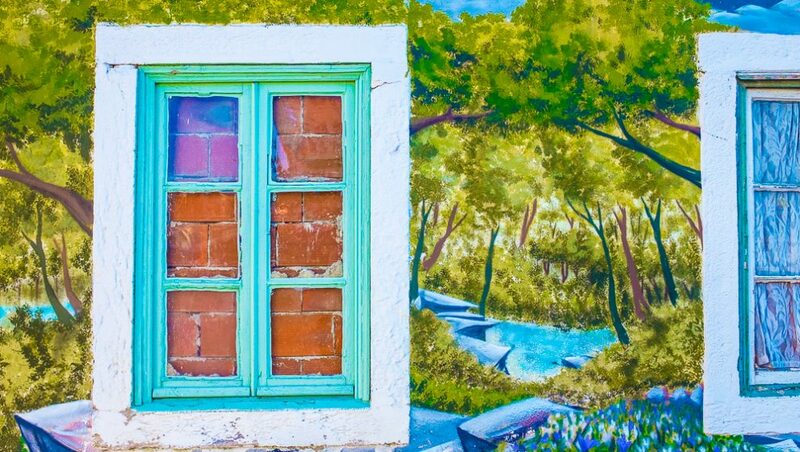 Graffiti and wall art are everywhere in Portugal, typically some real art mixed in with traditional tagging. 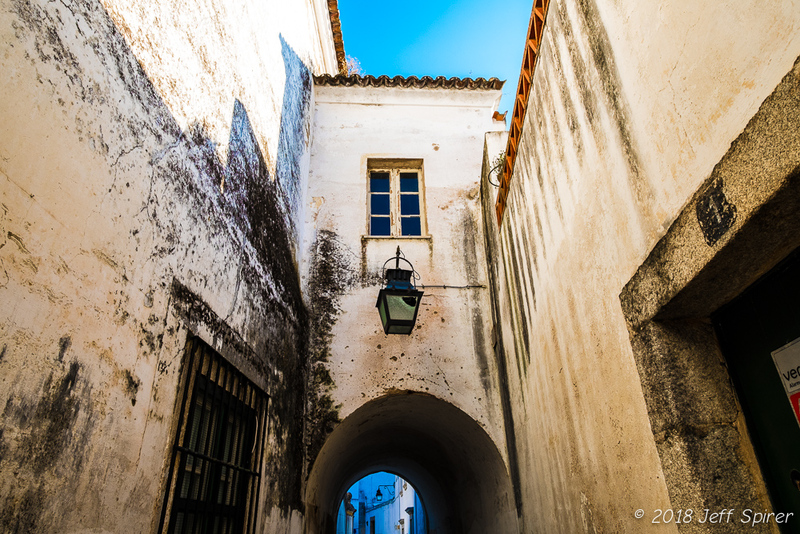 In Óbidos, it’s a big different. The city is mostly white with blue accents. Virtually all of the graffiti is, as if dictated by law, blue. It’s often handprints, for some reason, which are devoid of the modern signs of typical tagging, somehow enhancing the medieval feeling. And then there was the festival. While we didn’t stay for the Market, as it’s an evening event and we had to catch a bus back to Lisbon, some of the characters were in place towards the end of our visit. Looking out the train window en route to Évora, grape vines and olive trees increasingly dominate the landscape. The vines are gnarled and planted too close together for machine harvesting, an indication of the age of planting and more traditional methods. Alentejo is a huge agricultural region and produces much of the world’s cork in addition to wine, olives, and other agricultural products. 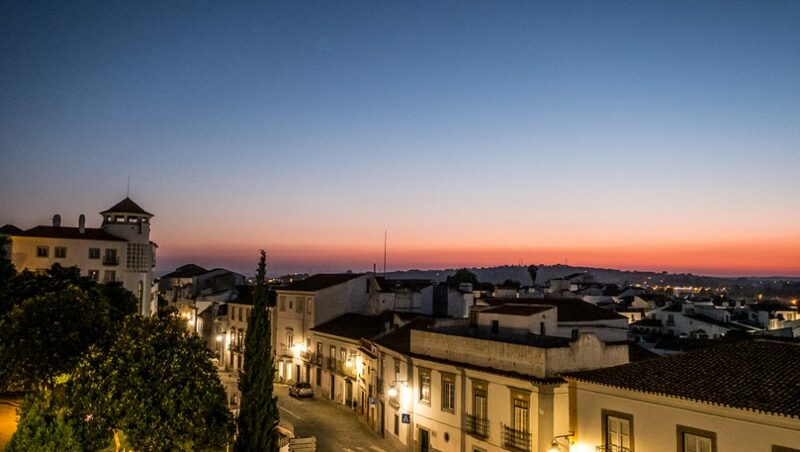 At night, the Alentejo viewed from Évora is a peaceful landscape. Évora probably started around 5000 years ago but it was the Roman conquest around 60BC that characterizes the early days of the city. 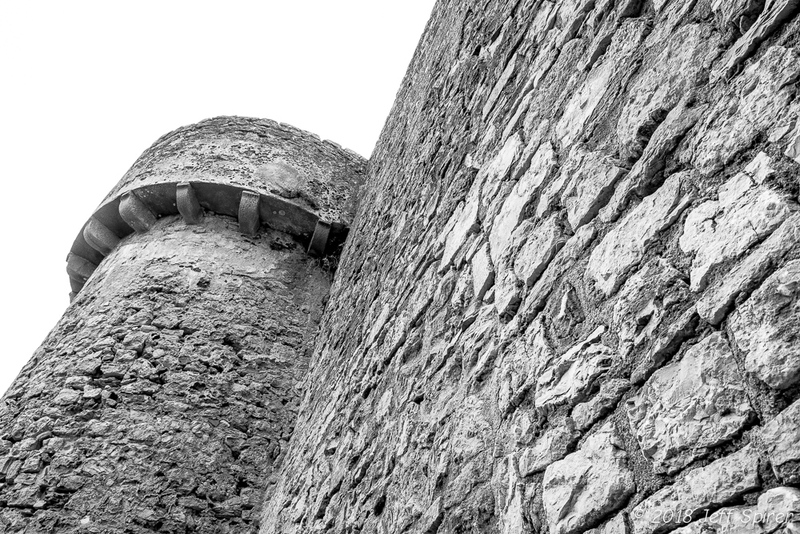 The Romans built a wall around the city and its tiny alleys. Plazas dot the walled city along with some interesting ruins. Although cars drive down the streets wide enough for them, everything moves at a slow pace. It’s not just the streets, it’s the intense heat that sends everyone to the shady side of the street walking through the city. In addition to the wall, there are two sites that recall the Romans. 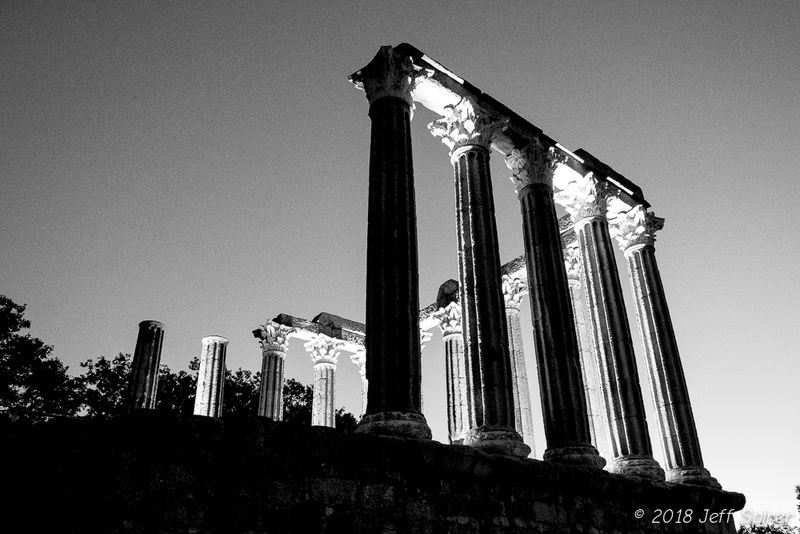 There is a Roman temple, which appears in every tourist guide to the city, with good reason. It stands high up, alongside an area for viewing the city. At night, lights make it stand out even more than in the daytime. The other Roman site in Évora is the Roman baths inside City Hall. 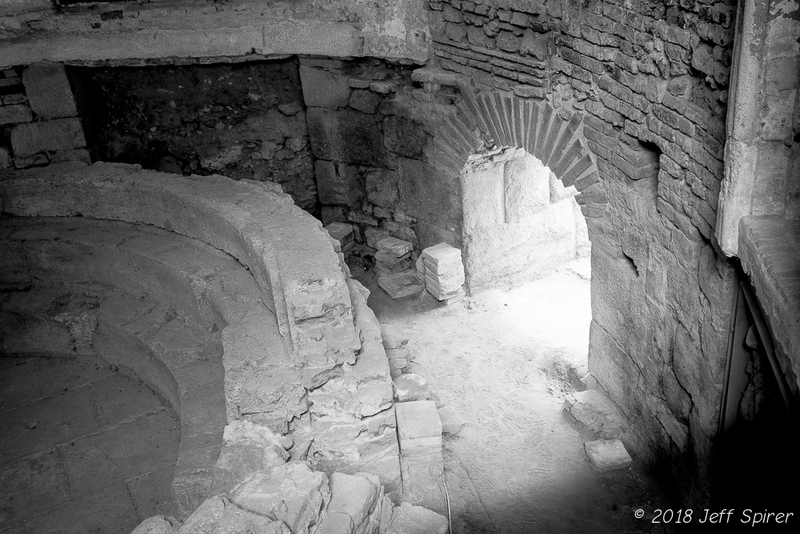 Unlike the temple, the baths are a recent discovery, buried for many years. They were found during excavation under City Hall and are nicely preserved. To see them, it’s necessary to go into City Hall, then they have their own area with a viewing balcony. Évora has a chapel of bones, Capela dos Ossos. 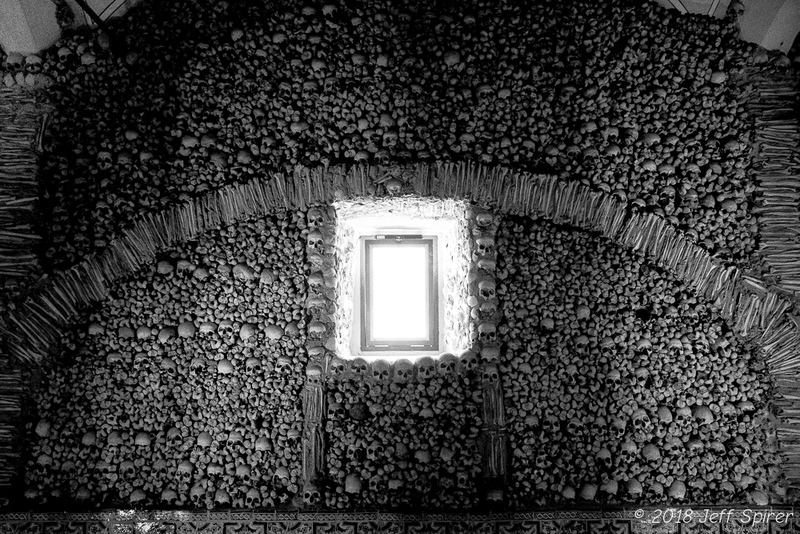 We’d visited another bone chapel in southern Portugal and had to visit this one as well. 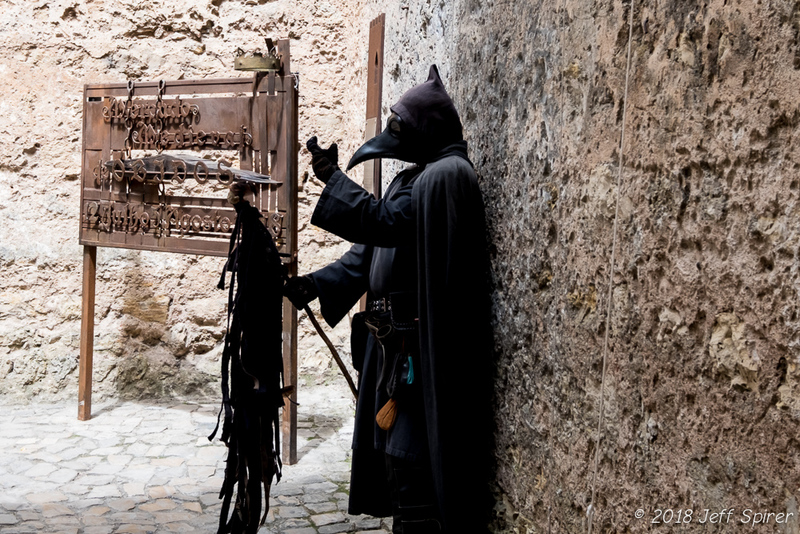 The visit was more restricted than the one in Faro, it was difficult to get close to the walls of bones. Given a choice, the one in Faro makes for a better visit but still, there’s nothing like being surrounded by skulls and other bones in a church. 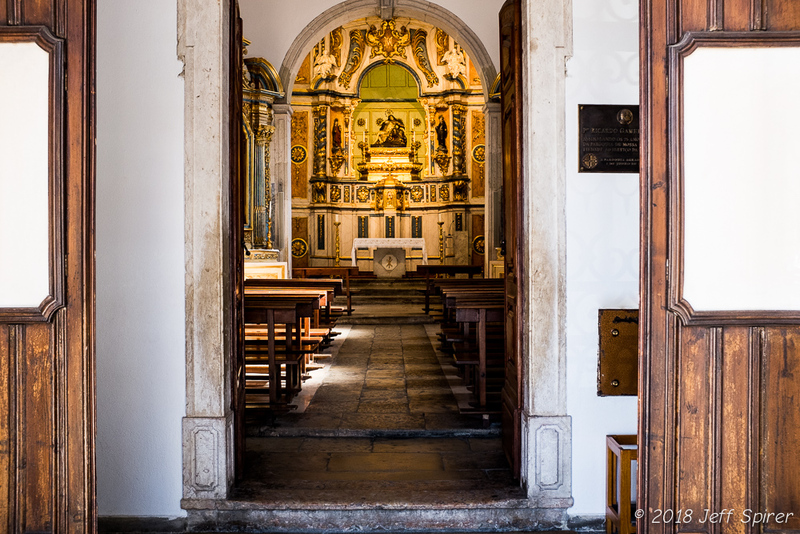 Another popular tourist attraction that is worth a visit is the Cathedral of Évora. Every village and city in Portugal has at least one church, and every has many, but this one is vast and beautiful. It’s even possible to walk on the roof, high above the city. Of course everywhere inside the walled city feels like a throwback. The architecture is well-preserved. Every building is painted white, often with a yellow accent color and green doors, although other colors appear occasionally. But it’s the odd bridges between buildings, the fountains that appear in squares and even indoors, that catch the eye. 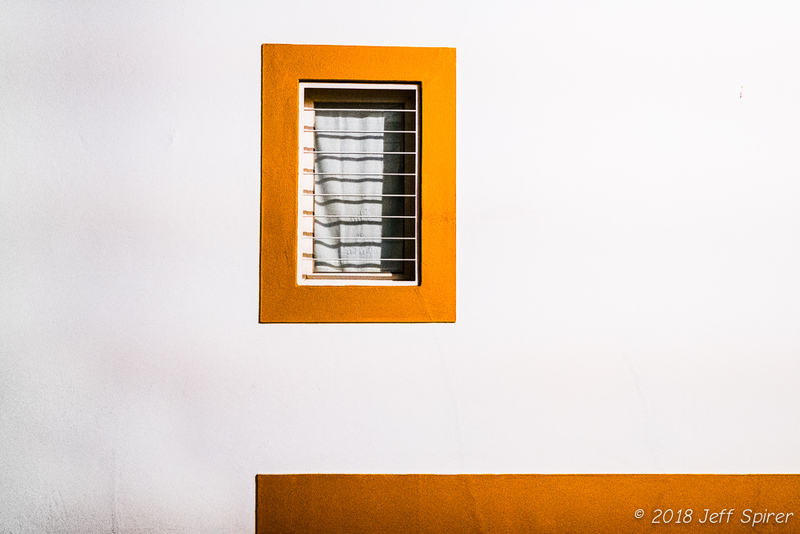 The buildings occasionally seem like modern art pieces when viewed through the camera. 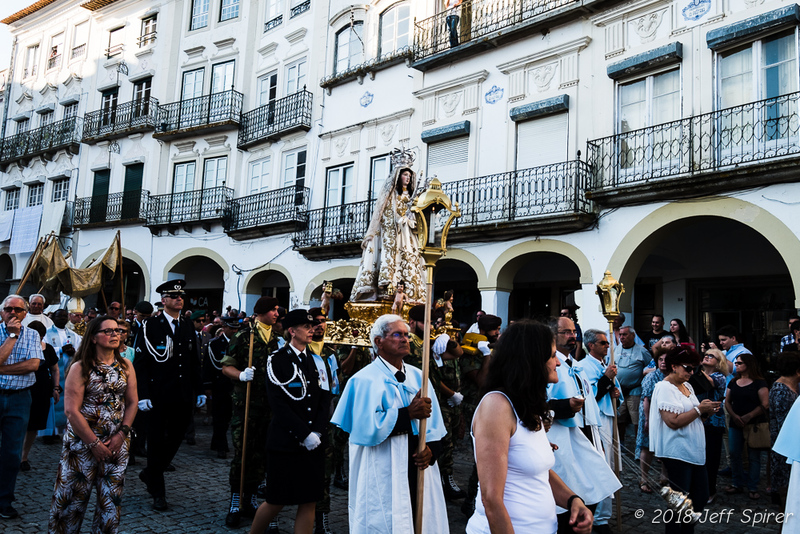 And as probably the most memorable experience, a religious procession appeared in the center on Sunday. With horseback riding, drums beating, idols hoisted up, and devoted townspeople alongside, the procession completed the feeling of being completely disconnected from modern times.